Joining in again with Sian and the Monday Memo Makers where we share our mail, our Mondays and anything new we have learned. 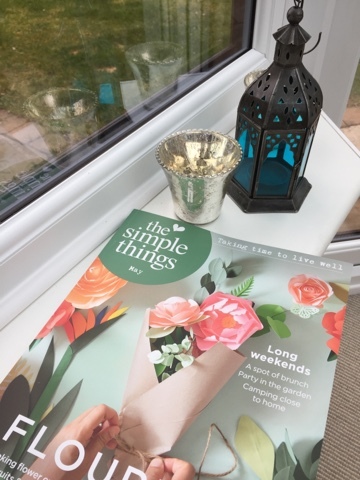 This little beauty arrived with my mail this weekend which is the perfect cue to put the kettle on, brew up a cup of tea, dive into the cake tin for a rock cake and sit in the sun having a good relaxing read. It's such a lovely magazine, and about the only magazine I've subscribed to that I have found my husband looking at from time to time! I can see me getting quite carried away with this new toy piece of crafting equipment. 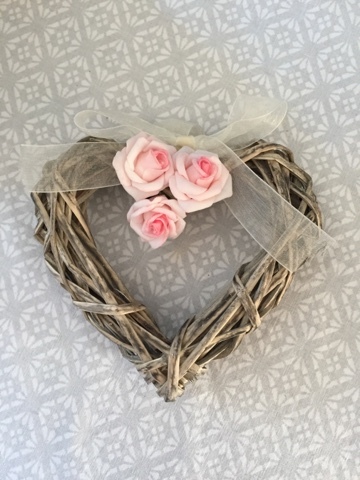 So all 12 wicker hearts now have three little rose buds on them and look very pretty, and I am currently trying to think of what other projects I can come up with that may involve a bit of hot glue gun action. Talking of weddings, a new pair of shoes has joined my wardrobe. 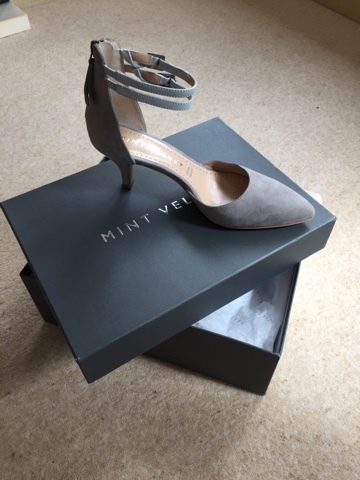 Grey suede, rather gorgeous, and hopefully part of the MOTB wedding outfit. I just need to have the bride give her opinion on them. But they're staying whether I wear them to the wedding or not, because they fit beautifully and I absolutely love them. So that's what is new in my world, I'm just of to Sian's to see what's happening with everyone else. Happy Monday everyone! 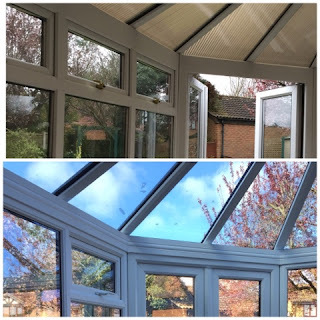 "Let's completely refurbish the conservatory" said my husband, so we did. New roof, new windows, new window sills. "As it looks so lovely and new again, let's replace the furniture too" he said, so we did. "That quilt that Coco likes to sit on when she's enjoying the sun on the sofa out there is looking old and faded" I said, "I'm going to order some new fabric to make a new quilt to pick out the colours of the buttons on the new sofa", so I did. "I'm going to make a start on that new quilt as soon as the fabric arrives" I said, but I didn't. Before I give you my excuses as to why I haven't even cut out so much as a square of fabric, let me first take your mind off the fact that I've not started what I promised by sharing with you a picture of the fabric that I bought. I think it will look nice. When I get round to cutting it out and sewing it together. Which may not be any time soon. We're going to hang a little decorated wicker heart on the end chair of each alternate row along the aisle of the room where Rachel is getting married. Which means we need 12. I thought I could get away with just winding the stem of each flower into the wicker but I don't think that it's going to be sturdy enough. So it means that I need to get to grips with a hot glue gun. Which I have never done before; wish me luck! 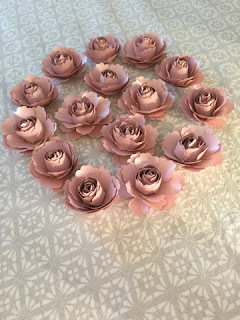 My dear friend Denise very kindly cut out the petals for me, and I 'just' have to curl and cut and stick them together to make flowers which will eventually be stuck onto ribbon (more hot glue gun action) to wind round serviettes on the dinner tables at the reception. Since taking this photo I've done a few more and it total I now have 26 finished roses. You see my dilemma - there is no time constraint on making a quilt but I have a deadline for the flowers! I know it seems like I have a long time but you have no idea how long it takes me to do each flower. So that's me for this Monday, sitting amid a crumpled heap of metallic foil which once decorated an Easter egg, and trying to get rid of the crumbs of chocolate from the keyboard of the computer. Let's hide the evidence eh? 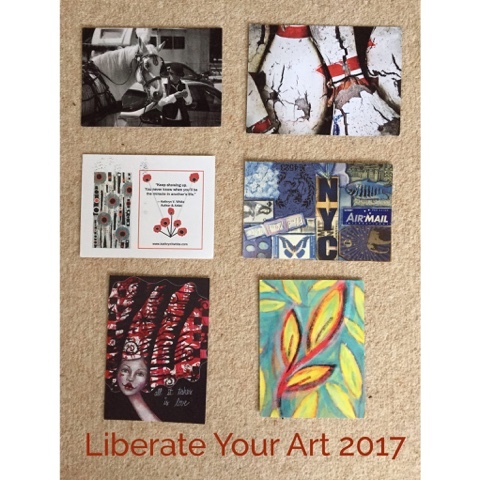 I'm not sure what made me decide to join in with Liberate Your Art for the first time last year. One of those spur of the moment things I guess, because there is no way on earth that I consider myself an 'artist'. I have trouble drawing a straight line with a ruler, so there is no paint related artist blood running through my veins! So when I read through the sign up post I realised that art takes many forms, not just the initial idea of paint on canvas. 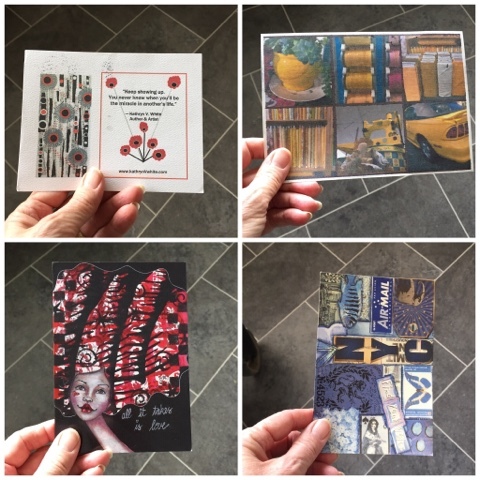 I've always been keen to create - whether it be by sewing, knitting or sticking bits of paper onto other bits of paper and creating scrapbook pages - so as a 'newbie' to LYA I photographed things that I had made as examples of my 'art'. When the LYA mail started arriving last year I discovered that out of the postcards I received, some of my favourites were photographs and I realised that you don't actually have to physically make something for it to be art, that you can make art through the lens of a camera. I filed that idea away for the coming year's project! Enough of my history with LYA - let me share some very special mail that has arrived on my door mat within the last couple of weeks. From street life observations, finding art in a close up view of a vintage object, collage, and original art. And along the way I've discovered new blogs to check out and new Instagram accounts to follow. None of which would have happened if I hadn't been brave enough to put my insecurities aside and sign up and join in. My postcards came from many different states in America and one from Europe. Yes, one postcard had a very long round trip from Slovenia to America and then America to England! Now I'm thinking, we need to advertise this more in countries this side of the Atlantic - so please consider joining in next year. It's always good to receive Happy Mail, be inspired by others and forge new acquaintanceships. 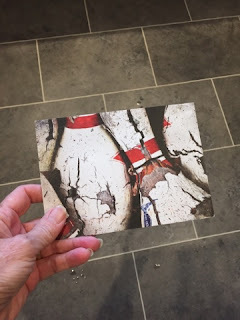 For my postcards this year I didn't photograph 'things' that I had made, but when I was on holiday last year I kept an eye out for things that I thought may be suitable for making into a postcard. Inspiration came in many ways! While on holiday in Portugal I found some very clever street art painted onto old crumbling cement walls. Then while laying on a sunlounger and staring up at the sky I noticed how striking the opening petals of a lily growing on the patio looked against the blue, and on an early morning walk, the blossom on the tree looked pretty with the sun gently shining through the branches. A trip to the English coastline gave me inspiration for my final card. I love beach huts, and we are lucky to live in an area which is well known for its colourful huts along the sea front. These were taken while walking between Frinton on Sea and Walton on the Naze on the Essex coast. 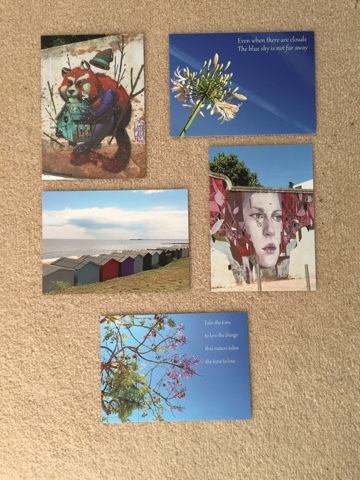 So these were the five postcards that I sent out. Please do visit Kat's blog to see the kind of mail which has been travelling between the participants of this year's project. Click here for more information. Ready for some facts and figures? But even better than that, join in next year! It really is a great project and Kat makes it so easy to participate in even if you live outside of the US. I promise to let you know when the sign up starts for 2018, so start thinking about what you can make into a postcard now! Oh my goodness, April - you're here already. I mean, obviously I knew you were on your way, but the time has just flown. I see you've brought the sunshine with you so you are very welcome in this corner of the country. You're just in time to join in with Sian's Mondayers. Just look at the texture on those bowling pins. What a clever photograph. Big thanks to Paula Bogdan of littlescrapsofmagic.typepad.com Quite apart from loving getting artistic cards through the post, I love how this project introduces you to blogs you would never otherwise have come across. Pop over to Paula's blog, and be prepared to be very impressed by the creative work that she produces. 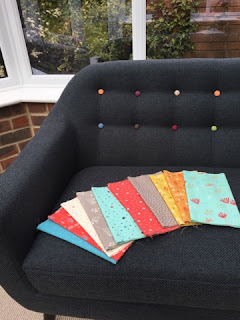 I have particular sewing envy of the little squares she has on her blog post. New furniture and a dog who likes to sun herself out there means that a new throw needs to be made. A perfect excuse to get the sewing machine out, buy some new fabric and get back into patchwork mode. Add a sprinkling of sunny spring weather and I think my Easter school break is sorted! I hope the sun is shining on your Monday, wherever you are, why not join in with the rest of the Monday brigade and share any mail related or Monday memos?